If you were on a hike and stumbled across a beautiful waterfall, what would you do? Would you stick around to enjoy it or continue along your way, generally unfazed? Dunn, an experimental researcher in the University of British Columbia’s psychology department, has conducted studies showing that people with more money tend to be less joyful and appreciative of those moments. “People don’t spend their money right,” Dunn continued. They went back on the B.C. campus, gave a group of people $5-20, and asked some to spend it on themselves and others to spend it on someone else. 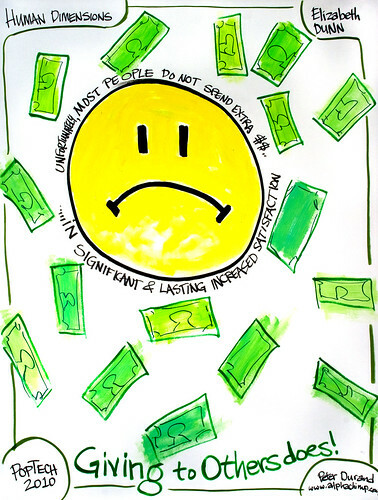 What they found was that those who spent money on other people experienced more happiness. When they pursued this study in Uganda to gain a perspective beyond North America, they found that while their spending experiences were different, people felt significantly happier when they reflected back on the experience. And this response was consistent no matter if the money was provided by the study or came from the spender’s pocket. Dunn also found that this type of generosity extends to organizations as well. Whether spenders were pharmaceutical sales teams in Belgium or dodgeball teams in Canada, when individuals in these organizations spent money (provided by the study) on each other, instead of on themselves, the pharmaceutical team sold more drugs and the dodgeball team won more games.